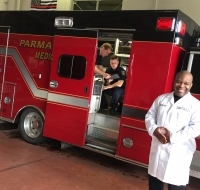 UH worked with the City of Parma and other area fire departments to train paramedics on advanced stroke protocols. UH also provided iPads so paramedics could livestream their stroke assessments to the ER doctor, expediting treatment upon arrival at the hospital. The work of University Hospitals neurologists on innovative stroke care has contributed to innovations in stroke care, as well as new guidelines for the treatment of patients with acute ischemic strokes, the most common kind. Neurologist John Andrefsky, MD, of UH Parma Medical Center, shared the telestroke program piloted at UH Parma, in which ambulances in six communities livestream their stroke assessments from the field to alert Emergency Department staff and expedite care upon arrival at the hospital. Dr. Andrefsky told the audience of neurologists that telestroke – an innovative approach piloted in Ohio by UH and the City of Parma – has dramatically reduced the door-to-needle times for stroke patients. Like door-to-balloon (D2B) times that measure how long it takes to open occluded cardiac vessels in heart attack patients, the D2N times mark the time from the 9-1-1 call to inserting the needle in the ED that delivers IV tPA to stop a stroke. UH trained area paramedics to conduct more advanced stroke assessments, utilizing an iPad to livestream directly to the ED physician or neurologist observing. By watching the pre-hospital assessment, the ED can alert pharmacy to mix the tPA and ensure the CT scanner was clear for the incoming patient. “Preliminary analysis shows that field telestroke helps us evaluate stroke patients more quickly and with greater accuracy in order to expedite treatment at UH Parma and transfer for interventions, if necessary,” Dr. Andrefsky said. New guidelines for ischemic strokes, which accounts for 87 percent of strokes – the leading cause of serious, long-term disability in the United States - also were announced in late January at the International Stroke Conference in Los Angeles. Several UH neurologists and RN stroke specialists attended the conference. “UH’s comprehensive stroke system has had a big impact on the American Heart Association’s new 24- hour stroke reperfusion window,” said neurologist Anthony Furlan, MD, Co-Director of the UH Neurological Institute. Neurologist Cathy Sila, MD, Director of the Comprehensive Stroke Center at UH Cleveland Medical Center, presented on brain imaging from the landmark DAWN Trial. This trial lengthened the critical window during which stroke patients could be treated with mechanical thrombectomy using a device designed to remove a blood clot from a brain artery obstructing blood flow to the brain. Although time is always important in treating acute stroke patients, the DAWN trial has shifted the focus to identifying other patients that could clinically recover with low risk of reperfusion injury when treated with mechanical thrombectomy. Dr. Sila and her team looked at other imaging modalities beyond CT scans to determine if there was an advantage to patient outcomes.